The Garden Club of New Jersey, Inc., by working on legislative action, is following in the footsteps of our illustrious GCNJ predecessors. They would be proud that we initiated a bill in the New Jersey State Legislature to have the beautiful Black Swallowtail Butterfly designated as New Jersey’s official State Butterfly! The results of this initiative were amazing as support poured in from all over New Jersey. All our hard work has more than paid off as we achieved a rare feat, obtaining unanimous bipartisan approval in both the Senate and Assembly and the final step, Governor Christie signing our historic Senate Bill S939/A2913 designating the Black Swallowtail Butterfly as New Jersey’s State Butterfly on January 11, 2016. Our project began in August, 2013 with the realization that New Jersey did not have an official state butterfly and 27 states did. We immediately took action, and made it our goal to educate our fellow garden club members and the public in the need to grow our sadly declining pollinator population as they provide one third of the food we eat and are an incredibly important component of our interconnected environment. Garden Clubs and the public responded by implementing awareness and taking crucial steps in our own yards and gardens, public gardens and community gardens by planting host plants for caterpillars, and planting species of flowers, trees and shrubs that provide much needed nectar and pollen for our butterflies and bees with an emphasis on native plants. Many clubs have formed Pollinator Project committees and featured pollinators and programs on butterflies, bees and wildlife in ongoing efforts to help reverse the decline of our pollinator populations. Our parent organization, National Garden Clubs, Inc. has embraced these efforts and more with NGC President Sandra Robinson launching “Leap into Action” projects designed to grow our wildlife population with special emphasis on helping amphibians, birds, bees and butterflies. The Butterfly Committee has a new butterfly booklet available for download or purchase, entitled “Inviting Butterflies Into Your Garden”. Simply go to: National Garden Clubs, Inc., click on: Presidents Special Projects, then: Monarch Watch. Watch for more “Butterfly & BeeGAP” related projects including building pollinator hotels, butterfly gardens, Million Pollinator Garden Challenge and Certifying Wildlife Habitats through National Wildlife Federation. We can impact more “Environmental Legislation” and be a proactive voice for our pollinators in our communities and state. 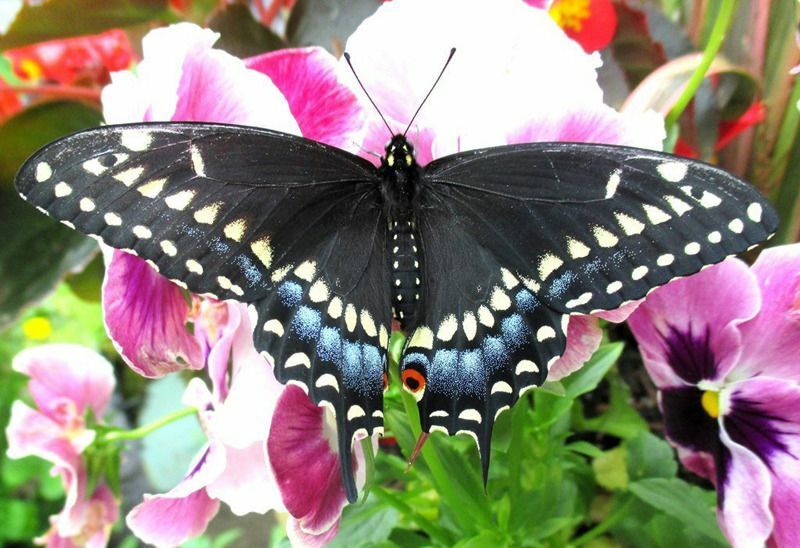 Click Here to read: “The Black Swallowtail has been nominated to be New Jersey State Butterfly” by Tomas Gonzales Vice President/Project Manager of Karen Nash Memorial Butterfly Garden. Click Here to read: Senate Bill S939 (identical Assembly Bill A2913) naming the Black Swallowtail as New Jersey State Butterfly have been passed and the Black Swallowtail Butterfly is now New Jersey’s official State Butterfly. Click Here for a list of plant genera that are nectar or pollen sources for Native Bees and/or Honey Bees. Thanks to Toadshade Wildflower Farm for their assistance.